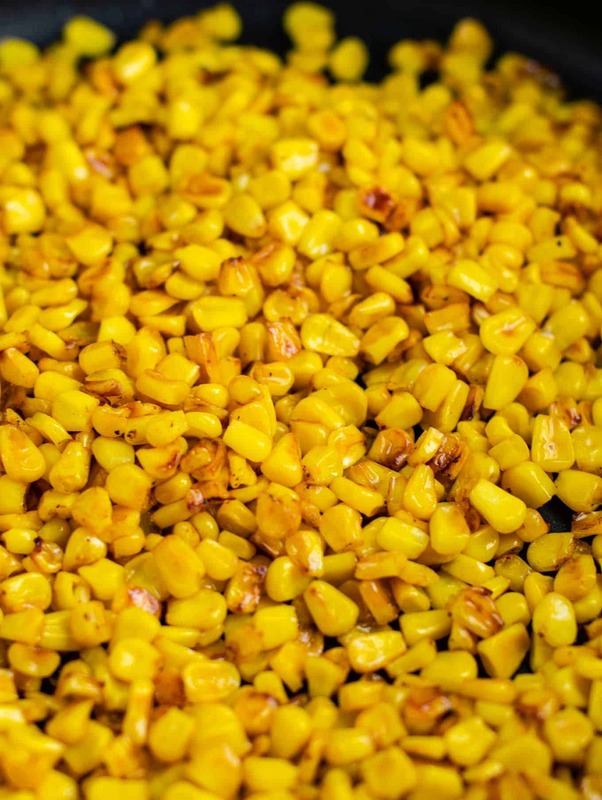 Today I’m sharing my very favorite way to make corn. 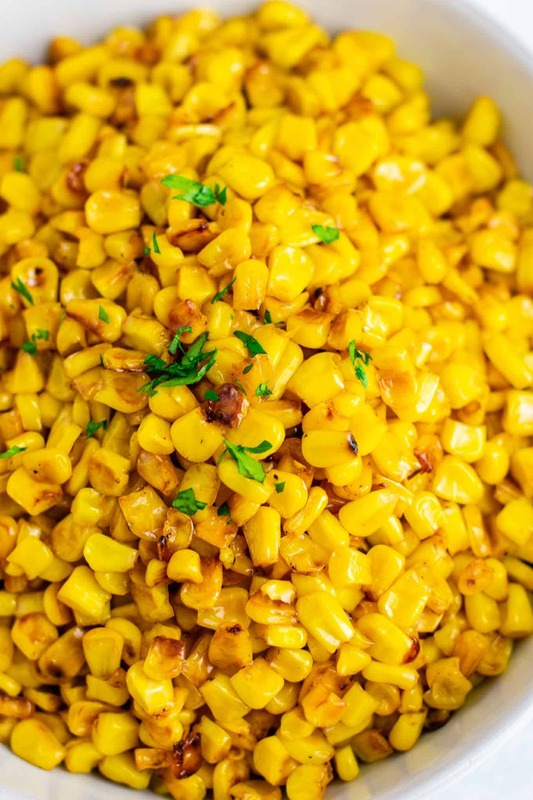 I’m pretty confident when I say that this skillet corn will change the way that you make corn forever! I’m also sharing it just in time for your Thanksgiving recipe planning. This will be one of your new favorite Thanksgiving side dishes! 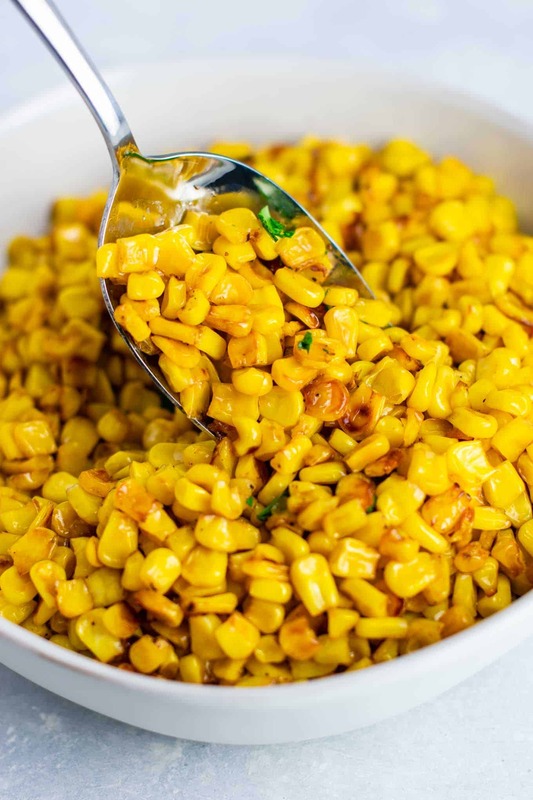 This is hands down the best Thanksgiving corn recipe and a tradition in our home! I have been making this recipe for years and years. I can’t believe I haven’t posted it on the blog yet! When I make this recipe, even people that don’t normally like corn eat it right up and ask me for the recipe. The texture is key here, so it’s all in the method! Trust me when I say, those crispy delicious edges are worth every minute of cook time. First, you need a very large nonstick skillet. (I use a jumbo cooker). I purchased my jumbo cooker at walmart for less than $30 and it is one of my most used kitchen pans! Melt your butter in the pan over medium high heat. If you are vegan, you can use vegan butter, or just use regular butter if you are not. Vegan butter and butter are so easily interchangeable, so this recipe can serve everyone from vegans to omnivores! Once the butter is melted, add in the corn, salt, and pepper. Cook on medium high heat, stirring often, for 30 – 40 minutes. Yes, this does take time, but most likely you are already cooking other parts of dinner, and will hardly notice the time going by. If you are making it for Thanksgiving, just give it a stir in between working on your other dishes. Just stir every few minutes and it’s a low maintenance delicious side dish! This is a great easy side dish recipe, and also another favorite Thanksgiving recipe that I make every year. 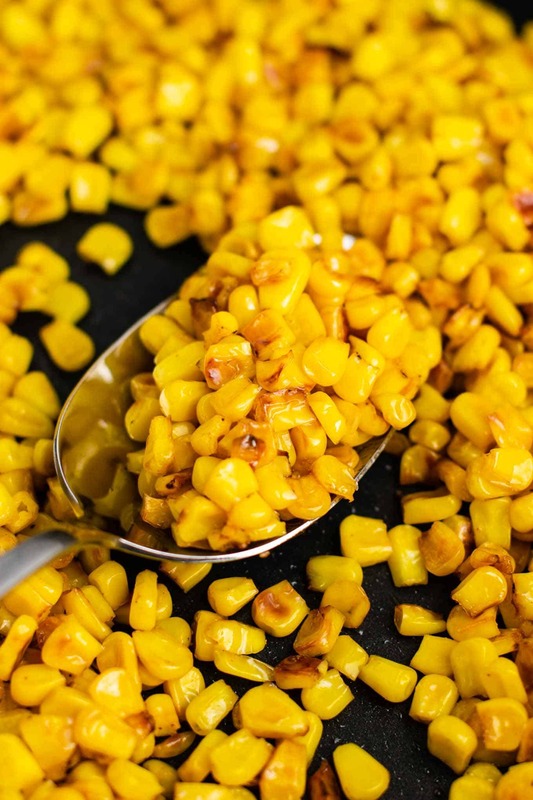 The key to big flavor is that we want to cook the corn until it starts to get chewy/crispy. Chewy really isn’t the best word to describe it, but basically we want the corn to get crispier edges without burning. You can tell that the corn is cooking how you want it by listening for “popping” almost like the sound of popcorn. When the corn starts popping, it’s going to start browning soon. Allow a few minutes to cook, then stir again. Just be sure that the corn isn’t burning, we just want to keep it on that high heat long enough to brown before turning. And keep repeating until it’s done! You can tell the skillet corn is finished when it has shrunken in size and has caramelized edges. 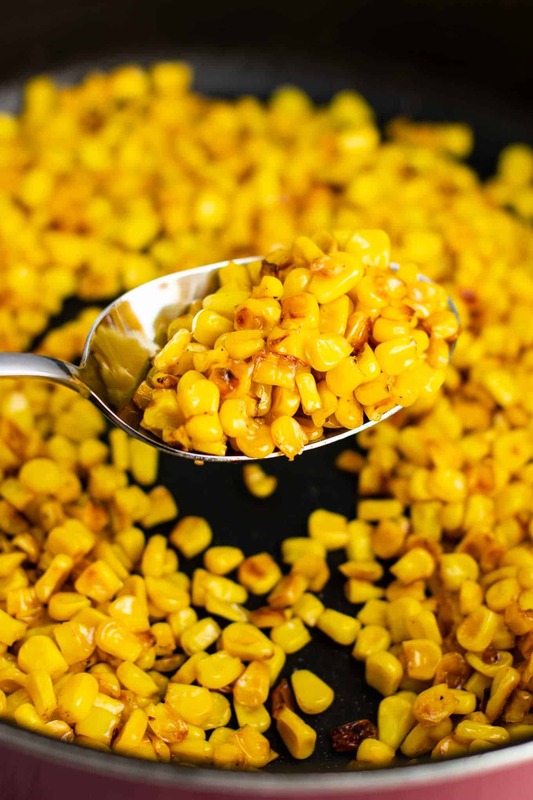 Taste as you go and stop once the corn is to your desired liking. For me, it’s usually at least 35 minutes or more, as I LOVE my corn to get nice and cooked down. Promise me you’ll try this recipe? I swear it will change the way you make corn! Hungry for more? Here are a few easy side dish recipes that I love! 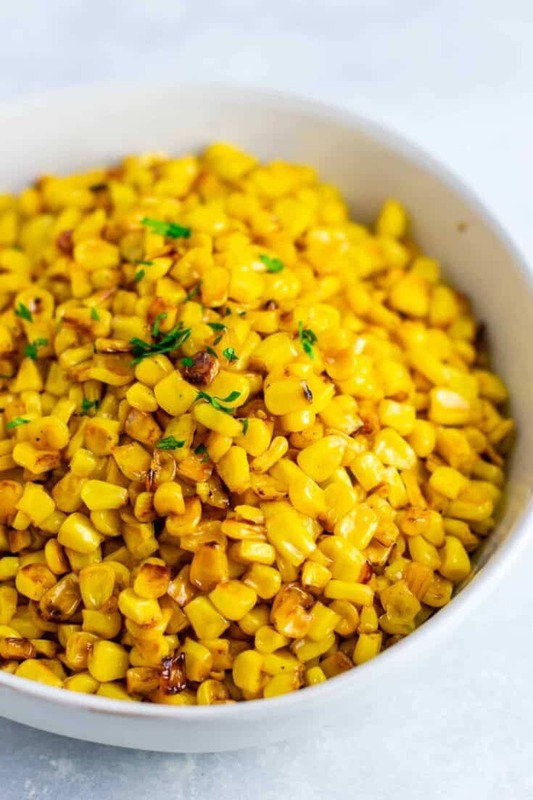 The best easy skillet corn recipe - perfect for Thanksgiving! Cook over medium high heat for 30 - 40 minutes, stirring often, until caramelized and browned. Listen for "popping" to know that the corn is cooking high enough. Stir after every few minutes of popping to avoid burning. 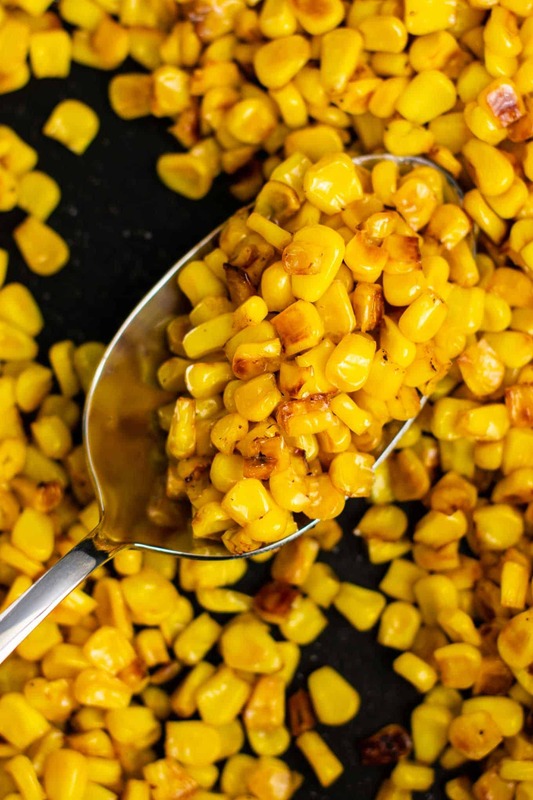 Corn should be browned and chewy, but not burnt.